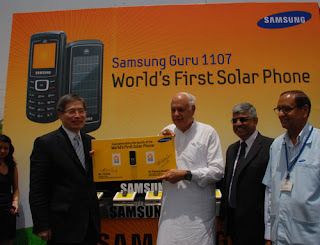 Samsung launches first of its kind, the cell phone that can be charged by using solar power. For India where the power scenario is not too good in rural areas due to frequent power cut and irregular power supply if any. Known as Solar Guru E 1107, the phone supports dual GSM bands viz 900/1800 MHz and includes 65K CSTN screen, FM Radio, MP3 ringtone, torch, mobile tracker, Fake call and a 800mAh battery and that too with a price tag of just Rs 2799/- only. The phone is commercially available in India and later it will also be launched in Europe, SE Asia, SW Asia and Latin America. 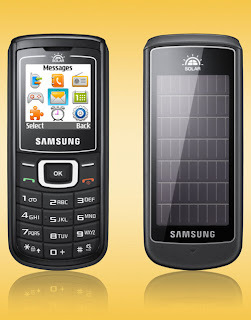 With one hour of solar charging through solar panel at back of the phone, it will provide talk time of 5-10 minutes. With about 40 hours of charging it will provide full battery power.